We don’t usually buy disposable water bottles, but in the summertime as we go places with the kids, we tend to use them a bit more often. Rather than just pitch them in the recyclables, we’ve been trying to use them in a few recycled crafts for kids. 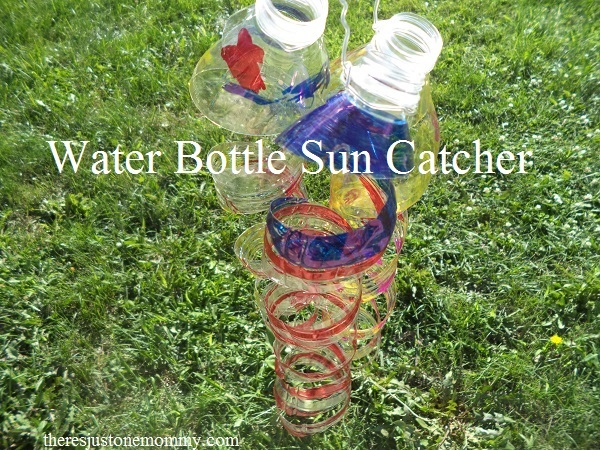 This Water Bottle Suncatcher is so simple to make and it looks beautiful hanging outside in the garden. We love crafting with recyclables. They offer so many possibilities, and you can’t beat the price when it comes to using recyclables for kids crafts. 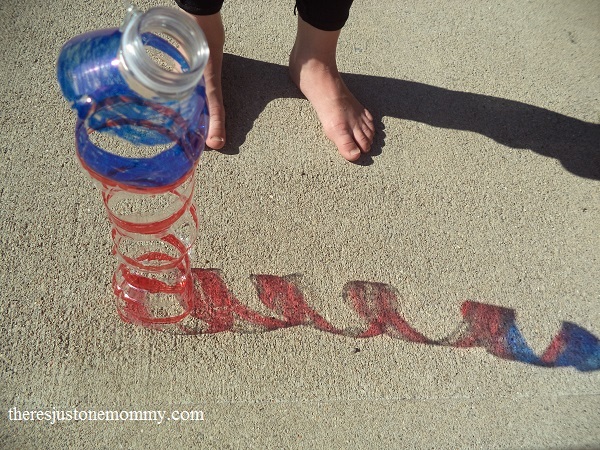 This simple water bottle craft has become one of our favorites to do each spring. If you are looking for a fun way for kids to carry their own water bottles this summer, check out this idea for a duct tape water bottle holder. 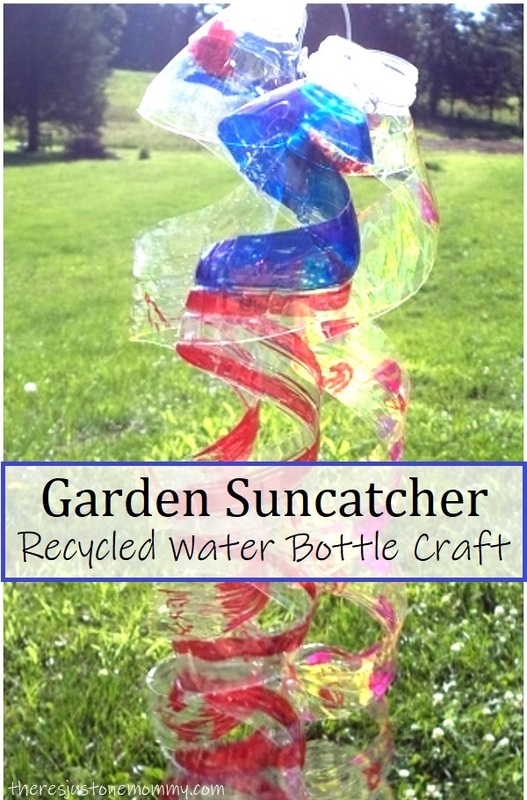 To make your recycled bottle suncatcher, start with a clean, dry water bottle. We decided to craft outside so permanent marker didn’t get on the kitchen table. You may want to put a protective cloth down if you are crafting at a good table. I gave the kids a selection of permanent markers and told them to color the entire bottle. The more you color the water bottle, the prettier your suncatcher will be. Next you will make a cut on the bottom edge and then start cutting around the bottle in a spiral. Our spirals were about 1 inch thick. When you are finished, tie your hanger around the bottle’s neck and check out your creation! The kids were fascinated by the rainbow shadows this recycled craft made on the ground. 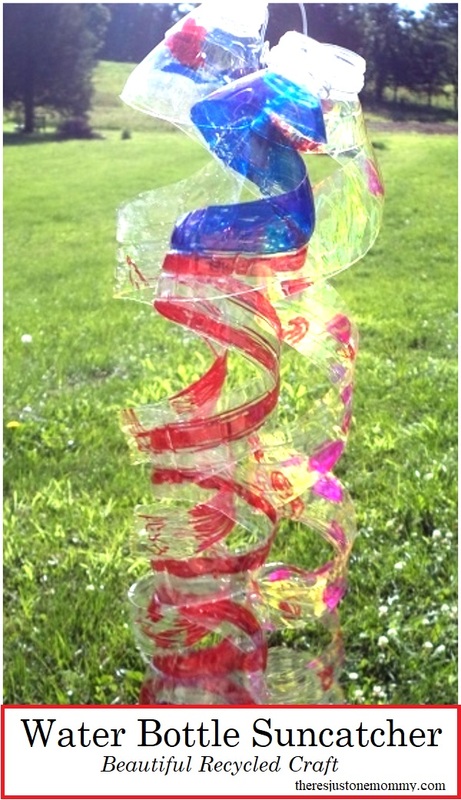 Your water bottle suncatcher will look beautiful hanging outside. You may want to make several to hang from the trees or in the garden. Don’t miss out on awesome kids crafts! Subscribe to our twice monthly newsletter. Those are so pretty! And simple too. I can’t believe how lovely these come out! The rainbow shadows are awesome – great idea! I wasn’t expecting the rainbow shadows — they were an extra cool bonus! What a cool idea!! Can’t wait to do stuff like this with my little ones when they’re a little older! Isn’t this fun and frugal?! Love it. This is great! I’ve been looking for some ideas to reuse items for a girl scout badge! I’m staring at a water bottle right now, and a couple others on my counter that just might get colored tomorrow. My question for tomorrow’s activity has now been solved. Thanks! Such a cute idea! And they turned out so pretty … I love the picture that captures the colorful shadow 🙂 Thanks so much for stopping by and sharing at this week’s Thoughtful Spot! I have to say that was my favorite pic! So glad it captured the colors!